President Nana Akufo-Addo has declared that the late former Secretary-General of the United Nations Kofi Annan, be given a full State Burial as befits his status as a global icon, diplomat and Statesman. Addressing a seven member delegation from the family of the late former United Nations Secretary General, at the Jubilee House, when they paid a courtesy call on him, the President said all expenses of the funeral will be fully taken care of by the State. He added that the State Protocol Department will be liaising with the family to work out all the full modalities for the funeral. The President also proposed that the funeral be held on the 13th of September 2018. Additionally, the President said the VIP section of the new military cemetery at Teshie, should be the most appropriate place of final rest for the remains of the late Kofi Annan. The delegation was led by Head of the late Kofi Annan Family, Isaac Hooper. The others are Juliana Addaquay, niece to Kofi Annan, Sylvia Cudjoe, niece of Kofi Annan, Kojo Amoo-Gottfried, nephew of Kofi Annan, Kobina Annan, brother of Kofi Annan, and Kojo Annan son of the late Kofi Annan. 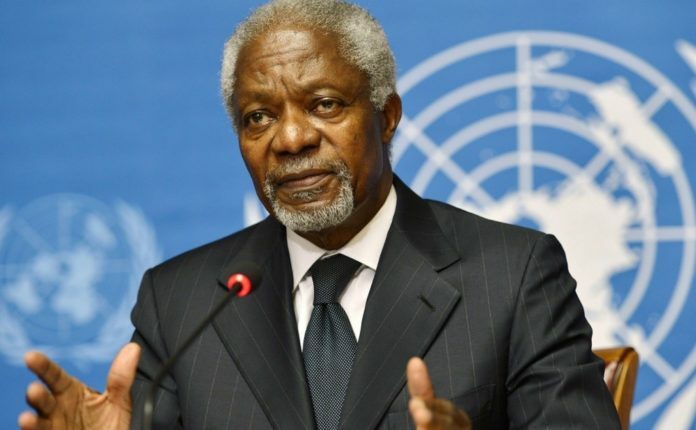 Mr. Annan passed on over the weekend in Switzerland after a short illness. Meanwhile, the United Nations will hold memorial “events in New York and Geneva” for its former Secretary General prior to the ceremony in Ghana.